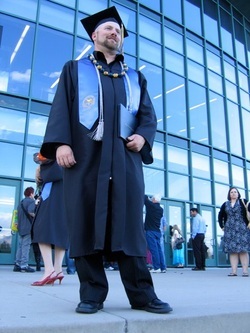 Christian Paul is a graduate with honors of Salt Lake Community College- AAS- Visual Art & Design- Photography Emphasis. Winter in the Cottonwood Canyons is simply magical. Between the access, snow quality and terrain, it is second to none. I love deep powder and big mountain snowboarding. This photo of me from Jan 2011 in Peruvian Gulch shows exactly why I love snowboarding. Let the rooster tails fly and the white smoke bellow from every turn. Simply put, there is no other wilderness system that offers so much hiking opportunity than the Tri-Canyons of the Wasatch. From foothill hikes with great overlooks, to alpine cirques with heavily glaciated features, this area is a geological wonder. 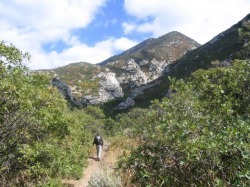 This photo is me heading up Ferguson Canyon for another great fall outing. 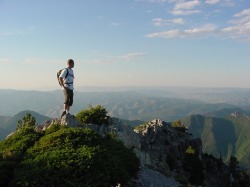 From April to October is the best time to enjoy these mountains for hiking. As well as some of the best hiking on the planet, this range of mountains have so many accessible peaks to climb. Some are very remote, and some involve difficult route finding and some scrambling. This is a picture of me on Gobblers Knob, 10,246 ft USGS, the highest summit on the Big Cottonwood/Millcreek ridge line. There is nothing like leaving it all at the car minus a pack, supplies and some fishing gear and heading out into the unknown. I find this to be essential for quality time when visiting a wilderness area. You have to spend a few days in a given area to really understand it. It is also a great feeling to leave behind cell phones, email and the man made environment that we are subjected to everyday. Backpacking brings us back to the natural world. 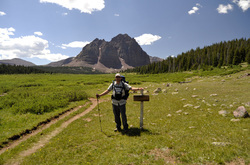 This picture is me backpacking Red Castle- High Uintas Wilderness- Utah 2010. I love being outside. Getting in touch with the earth and sleeping under the stars is something very sacred to me. It purifies the human spirit. This picture is of me enjoying a nice night by the fire in the High Uintas Wilderness, Utah. I do enjoy fly fishing when I am hiking and backpacking. I practice catch and release tactics. But I will keep an occasional "big one" for dinner or trout and eggs for breakfast while I am backpacking. 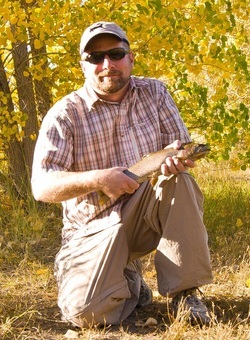 This picture is me with a 17" Cutthroat Trout I caught in Bells Canyon, Wasatch-Cache National Forest, Utah.